In geometry, volume is the quantity of space that a shape occupies. From the existential standpoint, volume is the quantity of space that we occupy, temporarily, and it is also the quantity of space occupied by the ones we love, people we often love because of that volume, that is, for how they are able to shape the space around us. And, as a matter of fact, death turns things into nothing by turning their volume " consequently the space they occupied " into nothing. And love too stops before this subtraction. This must be the reason why, since the dawn of civilization, sculpture has been, even more than painting, the first way to depict the things we love and crave, aiming at making them endure in a hard, eternal material: to that end the monumental public sculptures devoted to gods and heroes, or the domestic, small ones of Lares and images of loved ones. Volume, being a unit of measurement, indicates the quantity, whereas our desire and love are fulfilled by the quality showed by a certain volume, a quality which is expressed by the shape. Mankind is marked by an innate, almost divine, need for harmony whose vehicle is shape. And harmony, we dare say, is synecdoche of beauty. 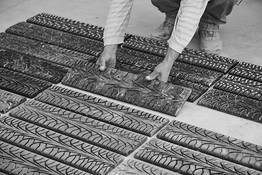 So, volume gives the measurement, shape moulds the volume and generates harmony which, in turn, is principle of beauty. 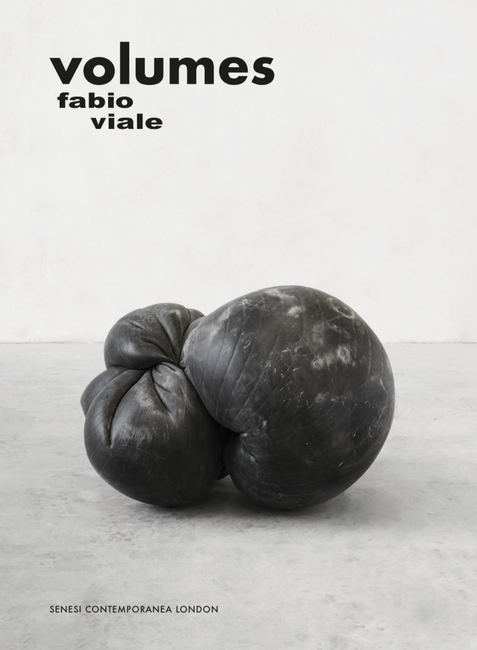 Taking our argument back, in a decreasing climax, it is clear that the core of the sculpture is first and foremost the “volume”, and it shows in its essential and primordial dimension in some of Fabio Viale‘s works, especially the most conceptual ones, where the artist disengages from the shape and plays with the material so to floor the observer. Let‘s think about the orbitals, inflated inner tubes, or to the tyres that inspire metaphysical thoughts for their “being” alone: at first sight, they only look like volumes that occupy a space and are touched by the light, that are able to express perfectly the dasein, the existence of beings, as Heidegger would say, able to represent the thing- nature of things, that is, things being things, that can reveal the truth of one thing as only a work of art can do and of which not even the thing was aware. But at a closer look, we realize that they, the inner tubes and the tyres, are actually petrified in marble, and lightness is apparent, the result of a détournement by which the assumed hendiadys material-shape fails and so does the arrogant avant-gardist pretension to tell the truth of the thing by exposing the mere thing: for example, how an object trouvé could have a meaning if tyres were actually tyres and rubber was rubber, and instead the artifice in Viale‘s works is a powerful means for a new knowledge, because the artist‘s and the poet‘s “goal is wonder”, and it is wonder itself " what Aristotle defines thaumazein - that generates philosophy, art and, for miraculous overabundance, truth. Fabio Viale is a traditional artist for whom “making” is equal to “thinking”, one of the examples of that kind of sculpture made by “subtraction” as Michelangelo used to say, extraordinarily talented in using an ancient material as marble, but at the same time a totally modern artist thanks to the irony he uses to approach the shape (not only volumes) and emulates the masters who came before. Nevertheless, his style is never a vain quoting, more typical of the post-modern style (for example the plaster moulds of classical sculptures by Giulio Paolini or the “Venus of the rags” by Pistoletto): he rather enhances the ability to translate the persistence of the shapes in the strict modernity, by chasing a second beauty, by identifying a second " first of all aesthetic " additional meaning to an already existing work and which has already said everything, fulfilling its essence. Let‘s think about the tattooed ancient busts that perhaps are among his most renowned sculptures: Viale makes an extraordinary crasis, a sort of semantic acceleration, when he impresses, as drawings, the scenes of the Last Judgement on the so-called Gaddi torso, a sublime mutilated example of the Hellenic sculpture and source of inspiration during the Renaissance also for Michelangelo; or when Canova‘s Venus Italica, already inspired by Praxiteles‘ Aphrodite, is adorned with a full-body tattoo patterned after the traditional Japanese irezumi, so to make her " although in her thousand-year old chaste pose " a perfect model for a selfie to be posted on the Instagram. Also the Nike of Samothrace reproduced by imitating styrofoam is not a replica made of a different material, but it repeats the same shape in the same material (i.e. marble), only aiming at deceiving our perception; maybe as Viale believes that art is the relationship between us and the object, it is neither us nor the object itself, and the more this relationship amazes, the more it causes desire and triggers the aesthetic mechanism underlying real art.